This is an entire(-ish) linux distribution in git. Everything is built with tup. That's why it's called gittup. You can find it on github here. Of course, since you have the git history of all the packages, you can do it too. If it all works, you can send me the patch to include support for the new version. These are all imported into git from their respective tarballs. I couldn't find actual version control repositories for ncurses or nethack, which is why those have to be imported. I started to use gcc from their git repo, but the newest gcc in git is like 50% slower for some reason, so I ditched it along with all their other crazy non-C compilers and just imported gcc-core. You need tup, so install that and put it in your path somewhere. You also need to build a patched kconfig, which supports the pushd/popd directives. This is so I don't have to modify the Kconfig files in the kernel or busybox or wherever. And make sure you add tup-mconf and tup-conf to your path as well. Now you need to download the entire distribution. This is about 600MB worth of stuff to download, so it'll be a while. Also you have to type "git" and "tup" a few million times, because everything involves either git, or tup, or is named after git and/or tup. Once you get to this point, you own gittup.org as much as I do. Well, I still own the domain name, cuz I ponied up like 10 bucks for that, but I mean you have all the source, all the history, even this crappy webpage. You can post it all online somewhere and start your own linux distribution. Anyway, now you need to setup tup and compile everything. You need to initialize tup once. This sets the root of the build directory where tup will watch for files and track dependencies. It's kinda like git init, but for the build system instead of the version control system. Finally, you can build everything. You can use 'tup upd -j2' or something if you want to parallelize the compilation. Tup is parallel-safe, which is totally sweet. Whenever you edit source files, Tupfiles, change the configuration, pull things from git, or whatever, just run tup upd to bring everything up-to-date. If you want to avoid the time to scan the filesystem everytime you run tup upd, you can run tup's built-in file monitor (this uses the inotify interface). If you restart your computer, the file monitor needs to be restarted as well. You may need to up the /proc/sys/fs/inotify/max_user_watches variable before doing this. Sometimes it works for me with the default 8192, and sometimes I just bump it to 65536. Although the shell returns immediately after the monitor command, tup will be constructing the initial filesystem database in the background. It finishes when you see the line "Initialized in X seconds." With the monitor running, you should be able to change any file in the system and have tup upd start recompiling within a few milliseconds. Of course, depending on the scope of the changes, the actual build time may be much longer. Use the qemu.sh script to run the kernel and initrd that you just built. There is no root filesystem image, since everything runs from the ramdisk. When it boots, ncurses generates some weird messages about /bin/terminfo.src, but after a bit you should be able to press enter to get a shell. Then type nethack. First one to ascend in nethack using gittup.org wins an autographed CD with all my favorite MODs. I know you're thinking: "How can I pass up a CD of crappy music, autographed by some guy I don't know, who didn't even write the music?" I couldn't express it better myself. Now get to ascending! You should save your tup.config file so you can easily rebuild the distribution you just built. Probably the best way to do that is to track it in git. If you want to you can track it in a separate branch and merge the gittup.git master branch into your local branch. Another option is to just check it into the master branch. It shouldn't ever conflict, since I won't push a file called "tup.config" into the git repository. However, if you use the master branch, you will get messages like "Your branch is ahead of origin/master by X commits", which may be annoying if you plan to do real development in gittup.org and send me patches. Feel free to now play around with the config, but keep in mind that kallsyms and loadable kernel modules are not yet supported. Other options that I don't use may be broken as well, since my script to convert Makefiles to Tupfiles is not perfect. Periodically you may want to update to the latest version. This involves getting the new changes onto your machine with git, and then building them with tup. Harness the awesome power of tup to make changes to your system -- anywhere in the system -- and quickly see the results. Yeah, I'm marf. Yeah, my computer is captainfalcon. Yeah, I just edited the spellcasting in nethack because I felt like it. Then I changed ls to print "Sup bro, way to list those files", because I like to be encouraged when I list things, and because I like it when people call me "bro"1. Then I re-compiled both and got a new initrd in like two seconds. Go ahead -- try to change the ls on your system to print out extra messages for no reason!2 You can't do it!! Unless of course you're running gittup.org. 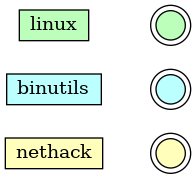 But if you're running gittup.org, why aren't you playing nethack or needlessly recompiling things just for fun? In fact, how are you reading this webpage?? It doesn't even come with a web browser. 2Naturally, this is a metaphor for doing something useful, and having a real build system to make it possible. Note: If you harmlessly change a file in gcc, it still takes forever, since it recompiles everything, since I don't have tup short circuit builds, yet. Note: You'll probably want a decent working knowledge of git to manage your changes. You can probably use format-patch to send me patches, and I think I can include them with 'git am' somehow. However, I'm no GitSu master, so I'll probably screw it up and have to re-do everything like always. Let's say your compy86 is running fine, and then you update to get the latest, and something breaks. You can use git bisect across your *entire* linux distribution to find the commit that broke it. Note: It may not work across config changes, since tup doesn't automatically run 'oldconfig' when necessary. Note: I've never actually tried this, so we'll just assume it works. In fairness, there are a few things gittup.org doesn't do. For example, you might use it to browse the web. Well, gittup.org can't do that. In fact, all you can really do with gittup.org is recompile things really fast and play nethack and watch movies with mplayer over sshfs.